It’s nice when someone gets it. Not only get it, but when what you want to do is something the people you’re talking to want as well. That’s what happened with Leah Thorpe from CETUS, the Cetacean Research and Conservation Society based on Vancouver Island, when we met for lunch at the beginning of the month so I could hear what their organisation is achieving with its education programmes to help support the resident orca and cetacean populations. Leah has been working with CETUS for a while now. She came in originally to run the education programmes and has found herself, with her co-worker Megan, running the organisation at a challenging time, when the Canadian government has slashed its funds for theirs and similar programmes. With some last minute funding, Leah and her staff have been busily getting ready for the summer preparing boats and crew to get out into the water and support the protection of the Salish Sea’s whales. The waters from the Puget Sound north, around the Islands, and up to Alaska, are home to 33 different cetaceans and marine mammals. There are gray whales, humpbacks, fin and sei whales, as well as harbour and Dall’s porpoises, and minke whales. But the undoubted stars are the orca – the killer whales (actually dolphins, but who’s quibbling?). There are two resident orca populations – the Southern (PDF) and Northern residents, each made up of a number of families, or pods. Both have declined in numbers over the last few decades, mainly due to difficulty finding their preferred food source, Chinook salmon. The salmon numbers have fallen because of, predictably, overfishing by us, and also, according to the marine biologist and activist Alexandra Morton, because BC’s wild salmon are testing positive for dangerous European salmon viruses associated with salmon farming (the salmon farmed in the US and Canada is Atlantic salmon). Either way, salmon numbers are down 92% on previously recorded populations. And the orca are suffering. But human activity also threatens the pods. This is where CETUS, and the Soundwatch Programme at the Whale Museum in Friday Harbour, come in. Their main education programme is face-to-face with boaters out on the water, educating the boaters on the Be Whale Wise guidelines for safe engagement with the orca and other cetaceans and marine mammals. CETUS works on a daily basis to monitor boat activity around the orca, and approach boats where there are signs that the guidelines—which are legal regulations in US waters, but only guidelines in Canadian waters—are being transgressed, and the orca are being harassed. CETUS run a number of programmes such as the Straitwatch and BC marine mammal response network, as well as the Robson Bight Warden Programme, and also the removal of old fishing gear from the water. This last one is a successful programme, and one that is easy to communicate and sell to people about the value of CETUS’s work. But with the boater education programme, there are still ways in which CETUS wants to tell its story more clearly, as boaters, often fishermen or visiting tourists—not usually the locals—can respond negatively to what appears, at first, like an official boat approaching across the water. What Leah and her crew try to do is always start by talking about the whales first, and using the anecdotes and stories of the whales, to engage the boaters and watchers. It’s only then that CETUS discusses the whale wise guidelines. And beyond this, strategically, as with many environmental groups, the ‘selling’ of its value to stakeholders, donors and government funding bodies, either direct or through public pressure, is a critical part of how CETUS manages its future. And this is where a writer and storyteller can come into the picture. Without getting weighted down with the formalized languages of fundraising or communication, marketing or social media, how can a creative writer come in and work with an organisation such as CETUS to simply tell a story about themselves in a way that is both authentic and that helps them realise their aims? That translates the wealth of research about orcas and their behaviour, and their decline, into something the boaters and public get immediately, and which changes their behaviour. And it’s here where things click. Leah and Megan have been working on this, and in a few weeks they go live with their first youtube.com viral video about the dangers of not properly monitoring and protecting the orca from overzealous or ignorant human interaction. As a mainstream organisation—a registered charity, and not a campaigning or pressure group—Leah is both hesitant and excited about what will happen when the video is launched. “But with less funds, we may need to take more risks,” she says. And we talk a little more about the aims they hope to achieve through the video. Wider recognition for CETUS’s work; wider public awareness; a clearer story. “Whatever makes it easier for the whales,” she finishes. It’s obvious with the decline of the orca populations, and their cultural, economic and ecological value to the region – although of course the orca are valuable in and of themselves, not in any metric that can be measured by us – that any and all attempts to protect their habitats and keep human-whale interactions to a safe minimum level is necessary. CETUS’s work, then, is necessary. So how to better tell their story, so their work not only continues, but grows? The next day I travel out with Five Star Whales on an evening whale watching trip. CETUS work closely with the whale watching industry, and there is a Pacific Whale Watching Organisation with the registration of 33 tour operators who all work together to ensure the safe and sustainable practice of whale watching. 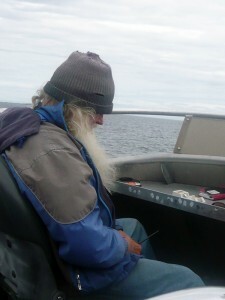 Most are part of the Orca Spotting Network, set up by Ron Bates, who comes out on the boat with us, voluntary now in his retirement, to help the boat find the orca. There are two other biologists on the boat, Kaegan, and Sarah, a young marine biologist with a BSc, moving on to do her MSc research on sticklebacks, but with, having grown up on the island, a healthy knowledge of the orca and of the surrounding ecosystem. Today we’re lucky. One in a hundred lucky, according to Captain Trevor. When we find the orca we find them happily fed, gorged on salmon, and in a playful and sociable mood—both with each other, and with us. 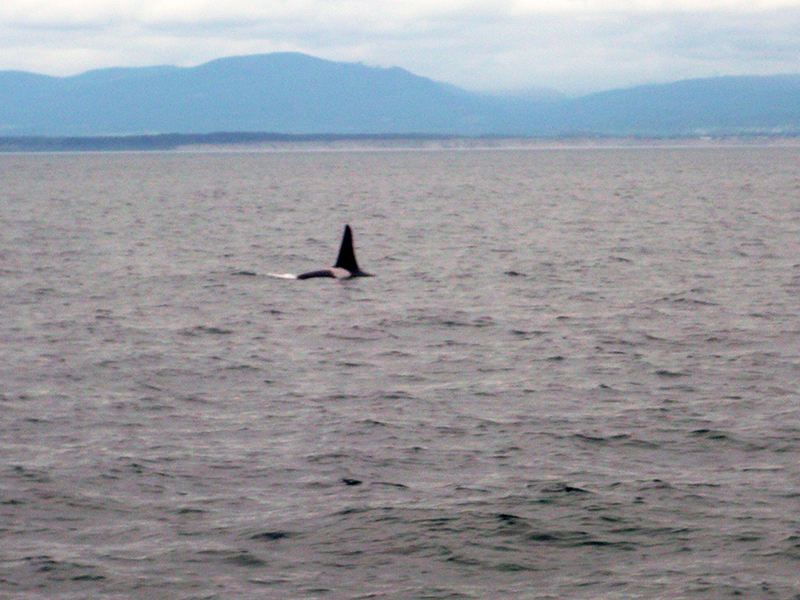 We see pretty much the whole of J-Pod, including the oldest orca on record, Granny (pictured above, identifiable from her saddle patch) who is 103-years-old, and who has children’s books written after her. They spyhop, tail strike, and breach, the adults and calves, all around us. It’s a mesmerizing display, everyone on board becoming, for the moment, children again as we stand and watch and take photos and cheer and gasp as we spot one, then another, then closer, then further away. I count 12 tour boats in the water in a half-mile radius around the whales, although really the whales are around us. They dive and reappear in far places from where they went under, and are always on the move, and when they are done playing (with us), they all dive and swim away, and we don’t see where they go—ready to move on to the next feed, or, having played, ready for other activity. Being with the orca, and on the best (the oldest, family owned) whale boat, with the man who set up the original spotting network (left, he looks asleep but he was just twiddling with the radio) feels a great privilege. When I told people all about the trip, this was the part they were most jealous of. It certainly made better for the jetlag and lonely intensity of the first few days of this seven-week journey. Stopping to think of the orca, being close to these incredibly sentient, emotional, social animals, thinking of what I learnt by watching Blackfish and by working with ORCA Your Seas in the UK, and what I’m already learning here, the reasons to be here make more sense.